Pizza is everywhere, but this unpretentious restaurant has the best you’ll find in Madrid in my opinion. 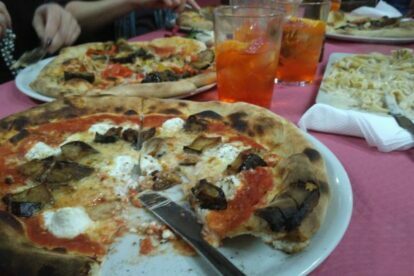 Run by Italians, Piccola Napoli gives you an authentic taste of Naples at a very reasonable price. They have a lunch menu of pizza or pasta with a drink and dessert or coffee for 9 euros, or 10 with a salad. There are also some special offers during the week, including an “all you can eat” night on Wednesdays – at 15 euros it could be just the thing for hungry teenagers! I found this place by chance – it’s close to where I live – and it was one of those finds I could not wait to share! As well as pizza, they do some pretty spectacular pasta dishes, and the dessert menu is short, but features all the classics; tiramisu, cannolo, panna cotta… They have a few Italian wines and lambrusco (nothing fancy, but perfect to accompany pizza), Italian beers and spritzes. They moved to a larger more modern premises last year, and the chefs can now be seen in the glass-walled kitchen, baking pizzas in the authentic wood-oven. However, the food is the star here, and though it isn’t really central, and most of the customers are locals, you’ll be happy you went the extra mile to experience it. They also deliver if you’re staying nearby!